You probably don’t need me to tell you that the average consumer’s expectations have changed drastically over the past couple decades. While offering a superb product or service to your customers is still essential to the success of your company, you now also need to ensure your customers’ overall experience with your brand is top-notch, as well. Not only that but since we live in an ever-connected world, you also have to do everything you can to ensure your customers remain engaged with your brand – even when they aren’t actively using your services. In other words, rather than seeing the customer experience in terms of a finite transaction, you need to look at it as an ongoing – hopefully never-ending – relationship between your brand and your customers. While there are a number of ways to go about doing all this, we’re going to focus specifically on using email to enhance your customers’ experiences with your brand. Perhaps the main reason email is such an effective way of doing so is because it’s incredibly versatile. For one thing, email is the most effective channel for marketing. According to eMarketer, 81% of marketers view email as the best way to generate new customers. Similarly, 80% of marketers say email is the best way to retain customers, as well. In terms of ROI, email marketing is tops, as well – recouping an average of $44 for every $1 spent on campaigns. In this article, we’ll discuss the best ways in which to use email as a marketing tool as well as a means of providing high-quality customer service and support. As we mentioned above, email can be used either proactively or reactively in order to fulfill your customers’ expectations – and then some. Let’s take a deeper look at the many ways in which you can make this happen. Every email you send out ends up being received by an individual person. Even if you send the same email to thousands of individuals at once, each of the people you’ve sent it to receive it individually, in their personal inbox. Because of this, you need to ensure the content you’re sending via email is highly-targeted to the recipient in question. 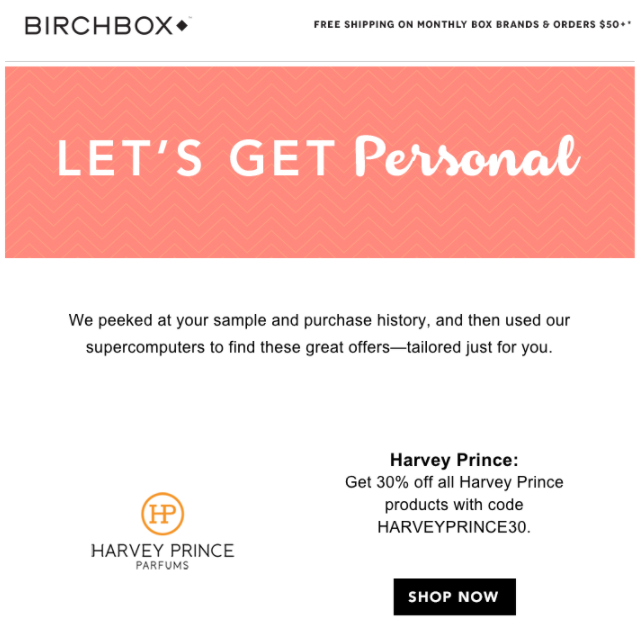 Now, personalizing your email content goes well beyond simply including the recipient’s name in the subject line and greeting (although this is important to do, as well). In order to truly personalize your email marketing campaigns, you have to learn as much as you can about the people on your mailing list – and deliver relevant content accordingly. While there are a number of ways you can gather this information, perhaps the most effective way to determine the type of content your audience wants is to simply ask them about their needs. Creating surveys to be delivered to your new subscribers will not only allow you to immediately learn a ton about them, but it will also show them that your goal is to begin providing ultra-relevant content to them as soon as you possibly can. In conjunction with such surveys, you may also choose to utilize predictive analytics software to both collect and organize even more in-depth information about your mailing list subscribers (as in the example above). This will allow you to create highly specific audience segments – in turn enabling you to provide laser-focused content and offers to each of these segments. Although email gives you the ability to contact every single one of your customers in one fell swoop, creating such generic email campaigns typically do more harm than good. On the other hand, investing the necessary resources into personalizing your email campaigns as much as possible will almost certainly be worth the effort in the long run. Going along with personalization, you also want to put the ball in your customers’ court, so to speak, and allow them to choose what they receive from you – and when they receive it. Immediately upon receiving a mailing list registration, REI sends the new subscriber an email asking them to provide more information regarding their interests. Rather than sending each subscriber the same outdoorsmen-related content, REI ensures that the right content goes to the right person, right from the get-go. Now, your customer’s preferences certainly aren’t set in stone, and will probably change from time to time. 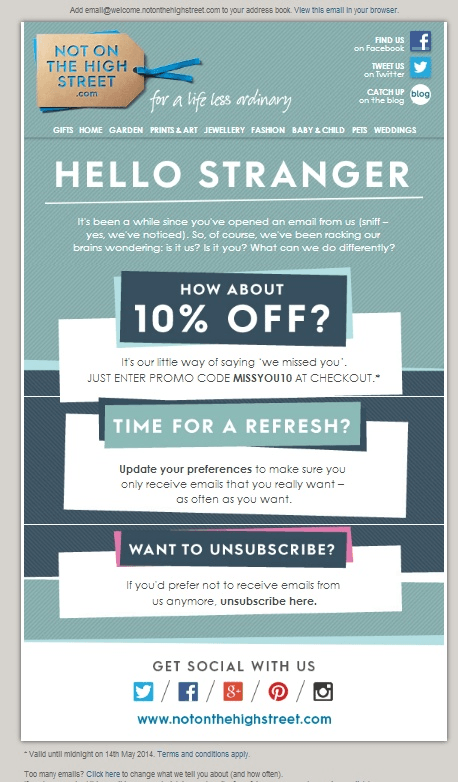 When this happens, there’s a decent chance that said customer – rather than putting in the effort to make these changes known to your marketing team – will simply unsubscribe from your mailing list. To decrease the chances of this happening, you’ll want to reach out to your subscribers at various times throughout your relationship with them. This allows you to glean updated information regarding your customers’ needs and desires as applicable to your brand. 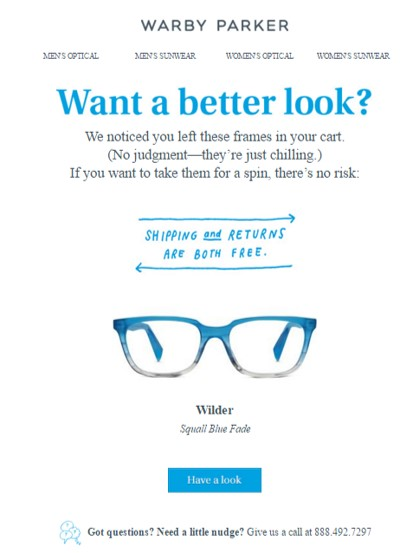 In the example above, Not On The High Street created an email to be sent to individuals who hadn’t engaged with the brand in a designated amount of time. These subscribers were given the option of changing their preferences regarding the type of content they receive, as well as the frequency of which they’d receive this content. (Yes, they were also given the option to unsubscribe completely – but only after all other options were exhausted). While you definitely want to send such emails upon noticing that your customers’ engagement patterns have changed, you also want to do so when in-house changes occur, as well. For example, if you’ve recently updated or upgraded the services you provide, or you’ve recently released a new product line, you’ll want to inform your customers of such and ask if they’d like to sign up to receive additional information. Again, the more you know about your customers, the better you’ll be able to determine how your brand fits into their overall lives. In turn, you’ll be in prime position to deliver exactly what they want from you, exactly when they want it from you. We alluded to this in the previous section, but it’s worth diving a bit deeper into. Once a customer has provided you with their email address, and given you permission to contact them, you should feel free to do so whenever doing so will enhance their overall experience with your brand. As we mentioned earlier, predictive analytics software is an invaluable tool for determining the best course of action to take when emailing a specific customer or customer segment. Predictive analytics software analyzes the actions taken by an individual customer, as well as other customers that fit their overall persona, and identifies the optimum content or offer for you to send them (as well as when to send it). For example, if a customer logs into their account on your site, then loads up their virtual shopping cart – but navigates away before they end up making a purchase – predictive analytics will assess the individual situation, and determine the best way to get the customer back on your website. This might mean providing the customer with an additional discount, suggesting additional products to add value to their potential purchase, or simply just reminding them that they never actually went through with the purchase in the first place. We said earlier that you should view your customers’ overall experience with your brand not as a series of isolated events, but as a continuum of one long journey. By proactively engaging with your customers via email at various moments throughout your relationship – and for a variety of reasons – you maximize the potential of your brand remaining at the top of their minds as they go about their daily routine. Email communication is, of course, a two-way street. As much as you hope to actively engage with your customers from a marketing perspective, you also want to keep your email channel open in the event that your customers need to contact your support team. In other words, when a customer takes the time to reach out to you via email, you should essentially feel obligated to provide for their stated needs as best you possibly can. Now, when it comes to providing customer service and support via email, there are two main factors to consider: timeliness, and thoroughness. For one thing, most customers expect to receive a reply from a representative of your company within 24-48 hours of their initial email. Additionally, consumers in need of assistance typically expect their problem to be solved within a single reply from the company in question. All this being said, simply solving a customer’s problem is really the bare minimum you can do for them. Even if you do mitigate the issue, you still run the risk of losing their business in the future (since they may be still unhappy that they had to contact your support team in the first place). So, in addition to resolving a customer’s issue or complaint via email, you also want to use this moment as an opportunity to provide them with even more value (which they may not have been expecting). 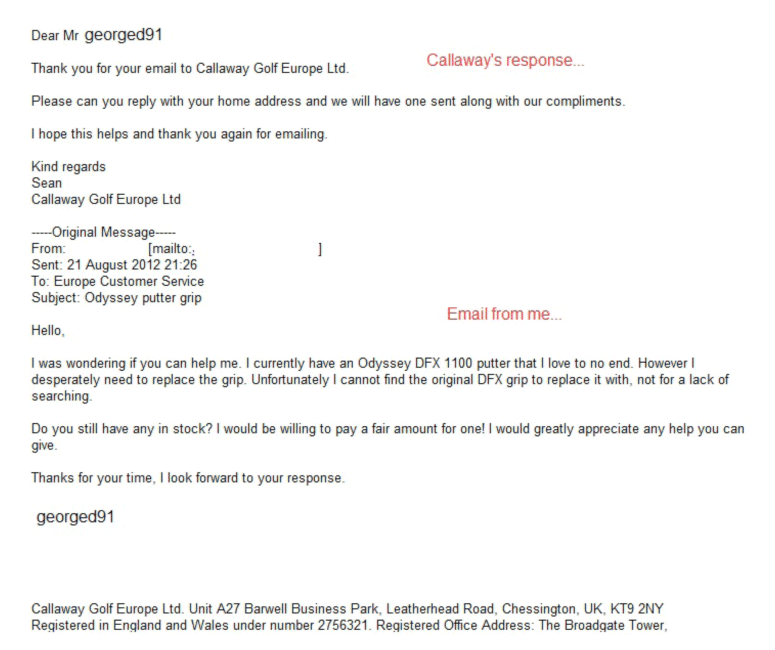 In the screenshot above, the customer states their wish to purchase a replacement grip for a golf club which had been discontinued by Calloway. Rather than blowing off the request and explaining that the model had been discontinued, the company’s support team decided to simply send the customer a replacement absolutely free of charge. Simply put: while there was a chance the customer in question would have continued to do business with Calloway regardless of the outcome, here, it’s almost certain that this exchange will lead them to be a loyal Calloway customer for life. Now, whether or not you’re actually able to solve a customer’s inquiry to their liking, you still stand to gain some bonus points by asking them to provide feedback regarding their latest experience with your brand via email. On the one hand, if you were able to help them, asking for feedback shows you actually care about the customer in question as a person, and that you want to continue providing for their needs. In other words, it shows that your obligation to them goes beyond simply solving a problem and moving on – you want to continue providing for them moving forward. On the other hand, if you weren’t able to help them, asking them for feedback shows that you’re not going to stop trying to help them even after your first attempt at doing so came up short. And, even if an unsatisfied customer is intent on defecting from your brand, you can still email them an exit survey in order to determine areas in need of improvement for the future. Whether utilizing email for marketing or customer support purposes, the main thing to keep in mind is that there’s an actual person on the receiving end of every email you send. In realizing this, you can easily see just how powerful a tool email really is: it provides you a direct line of communication with every single one of your customers, no matter how large your audience may be. By investing the necessary time and energy into tailoring your email content, offers, and messages to your specific customers, you’ll all but ensure your followers get as much value as possible out of every message that reaches their inbox. Thanks for your valuable information. This helps me a lot specially the email template.